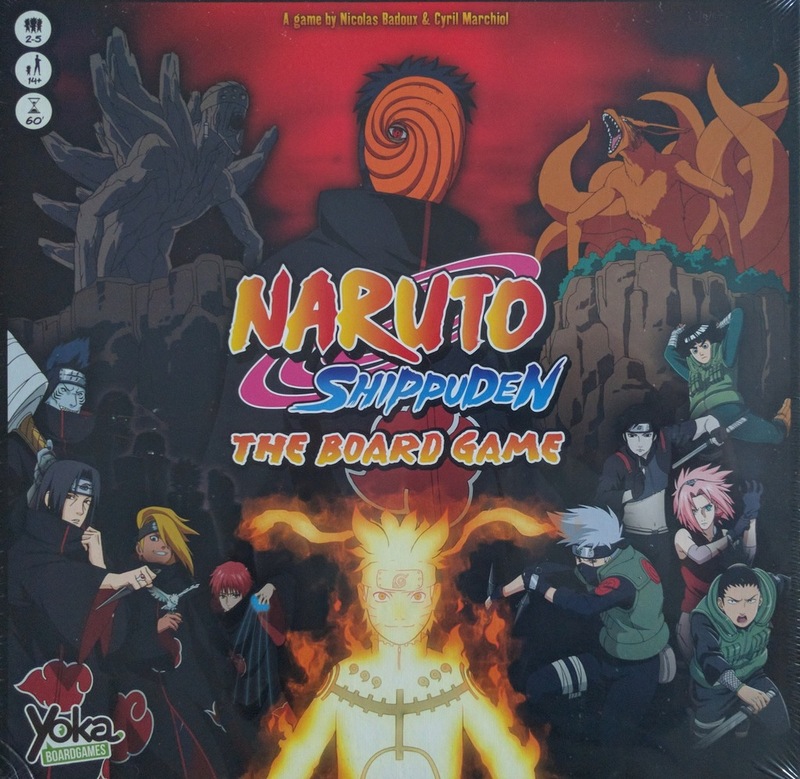 Naruto Shippuden: The Board Game is a game by Nicolas Badoux and Cyril Marchiol, published by Japanime Games. It is for 2-6 players. In this game, players take on the role of Naruto and his friends from the Hidden Leaf Village as they try to stop the evil Akatsuki from creating the ultimate weapon by reviving Gedô Mazô. Players will have to work together to eliminate each member of the criminal organization if they hope to stand a chance. In the end if they are able to defeat the mysterious leader Tobi and Gedô Mazô, they will be declared the winners. If they fail, the world will fall to the evils of the Akatsuki. To begin, the board should be placed in the middle of the play area. The Tobi miniature is place in the Suna village, area 1. Trap tokens are placed face down on each of the circular spaces on the board that are not numbered. A victory token is placed on the 1 space of the capture line. The Akatsuki cards are shuffled together. One card is placed face down on each of the spaces at the top of the board. Only 1 space is used if there are less than 4 players. Players choose a hero and are given the card and miniature for it. The player places the card in front of them and the miniature on Konoha, area 9. Each player also receives the hero’s deck of Technique cards which are shuffled and placed face down in front of them. The player draws a number of cards from their deck that is equal to the hero’s strategy attribute. The player receives 3 health cubes and a number of chakra cubes equal to the hero’s chakra attribute. The player then takes an experience cube and places it on the 0 space of the experience bar on their hero’s card. This is only used in the normal game. For an easier game, the B side of the card is used without the experience bar. The first player is chosen and play now begins. The game is played over 9 rounds. In normal mode, each round consists of 3 turns. Easy mode allows for an extra turn each round. Each turn is divided into 2 phases; player’s phase and Akatsuki phase. The first phase is the player’s phase. In this phase, each player will take 2 actions in turn order. The player can take the same action twice if they’d like. The actions available are move, meditate and fight. The first action is the move action. This action allows the player to move their hero miniature along a path up to 2 areas. However if they move to an area occupied by either the Tobi miniature or a trap token, their move is halted. The enemy is revealed by turning over either the Akatsuki card if the hero moved to the Tobi miniature or the token is flipped over if they moved to a trap token. It should be noted that if a hero is on an area featuring an enemy, they can not leave the area unless 2 actions are used for the move. Another action that can be taken is to meditate. This action allows the player to obtain 1 chakra cube. If their hero miniature is in Konoha, area 9, they will also receive a health cube. However heroes can not have more than 3 health cubes. It should be noted that if a hero loses all their health cubes, they also lose all their experience and are paralyzed. A paralyzed hero can not perform any actions until the end of the game. However they can still play support cards. The last action available to a player is to fight. This action allows the player to fight a revealed enemy in their area. To fight an enemy, the player rolls the number of dice indicated by their hero’s strength attribute. They may also add a Fight card to add to their strength. If the number of hits on the dice rolled are greater or equal to the defense of the enemy, the enemy loses 1 health point. If a die rolled shows the power icon, the power of the fight card is activated regardless of whether the attack was successful or not. Once the enemy loses all their health, they are removed from the game. The hero that defeated them gains an experience point which is shown by moving their experience cube 1 space. It should be noted that some enemies are granted special abilities. This means that the player must roll the special die before rolling their attack dice. The enemy gains a bonus depending on what is rolled. That bonus could be an extra defense point or possibly a special talent as indicated by the enemy’s card. Once all players have finished their 2 actions, the Akatsuki phase begins. The second phase is the Akatsuki phase. In this phase 3 steps are followed. First each enemy that has been revealed inflicts 1 injury on 1 of the heroes in his area. If there are more than 1 hero in the area, the players are able to choose which hero takes the injury. It should be noted that some enemies will have a talent that will activate in this phase. Immobilized enemies will not inflict any injuries, instead their immobilization is removed. In the next step, each player receives a chakra cube. They can then discard 1 Technique card. Afterwards they will draw cards until the number of cards in their hand matches their Strategy attribute. It should be noted that a player can not have more chakra cubes or technique cards then their hero card allows. Finally, if possible, the Victory token is moved 1 space along the capture line. If the victory token can’t move any further along the line, then the round ends. As long as there are still areas for the token to move to, then a new turn starts. The round can end in one of 2 ways, either with a victory or a loss. If the players eliminated the 2 Akatsuki cards before the end of a turn, then the Victory token is moved to the score line with the Konoha side face up. If however, at least 1 Akatsuki card still remains in play at the end of the last turn, then the round is lost. The victory token is moved to the score line with the Akatsuki side face up. Any remaining Akatsuki cards are placed beneath the deck. Once this is done, the Tobi miniature moves to the next area in order. If it was on the 1 area, it’s moved to the 2 area. A new victory token is then placed on the 1 space of the capture line and 2 new Akatsuki cards are placed face down on the spaces at the top of the board. A new round then begins. This all continues until the Tobi miniature moves to area 9, Konoha. At this time the two boss cards for Tobi and Gedo Mazo are revealed and put into play. Players are not allowed to heal with the meditate action like before. The two bosses must be defeated to win. If at least 1 boss is still in play at the end of the last turn, the heroes have lost. 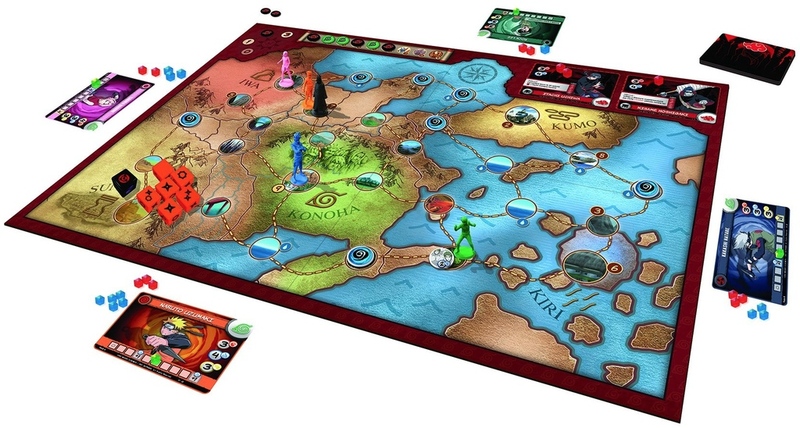 If however the players are able to defeat them both before the last turn, the heroes have won. One last note, Gedo Mazo is quite powerful. When he enters the game, he will gain a number of health points equal to he number of players and a number of defense points equal to 1 + the number of Akatsuki victory tokens in the score line. Also, when he inflicts an injury, it’s not on just 1 hero but on every hero on the board. Good Luck! The components for this game are really awesome. There are miniatures for all the playable characters as well as the 1 for Tobi leader of the Akatsuki. These are really nicely detailed and are brightly colored making them easy to distinguish between. I really like the sculpts and think they are pretty cool. The board is pretty darn cool too. There’s a great map of the regions from the show. The art is really great looking. There are plenty of great tokens that have designs and character pictures from the show as well. The game also has clear plastic cubes for health, chakra and experience. These remind a lot of the cubes from Pandemic. They’re really great and add a cool look to the game. There are also a handful of dice for attacking and the special die. These are really brightly colored and have some cool looking designs on them as well. Of course the best part of the game are the cards. The artwork on these looks ripped from the show and each one is really great. The card thickness is really nice and the art is wonderful. I really like how that each character’s deck has a specific look and design on the back so that you can easily determine which deck goes with which character. That’s a really cool touch that I love. Overall, the game looks great and each piece is really great quality. I really like it. The rulebook for this game is actually quite large. It’s not all very thick but it’s as big as the box is. There are tons of great pictures and examples throughout the book. The first couple of pages detail the components and setup of the game. There’s a great page that gives you a bit of an insight into the playable characters and it points out which characters are easy to play and which are harder. The next couple of pages go through the phases of the game and how everything works together. The next few pages go through a couple of turns of the game so you can really see how the game actually is supposed to be played. From here there are 2 pages of detailed explanations of each enemy, trap and boss that are a part of the cards and tokens. There’s also a great section with some frequently asked question. The book also has a glossary of terms used in the game. The back of the book has a great reference with the rounds and phases of the game laid out. Overall the book looks really great. Sure there are a few minor misspellings and things like that but overall, it’s fairly simple to read through. A really good job. This is a pretty good game. That is to say, as long as you like Naruto Shippuden, it’s a good game. Thematically the game is pretty interesting and quite fun for fans of the show. You really get a sense of playing your favorite character with their special decks and miniatures. I really enjoyed battling the different villains of the show and the experience of working together to get things done. That’s the good side of the game for me. Now here’s the bad part. If you don’t like or know anything about Naruto Shippuden, you’re probably not going to be interested in this game at all. There’s quite a bit of randomness and repetition. The dice roll battles add a good bit of luck as you can prepare for a battle the best way you know how and then have a bad roll and lose. What’s even worse is that if you lose all your health in a battle, all your experience is wiped clean as well. I really did not like that part. For that reason, we started going with a house rule of only losing half of your experience rounded down. That way you don’t lose everything but you do take a penalty. This seemed to help things out a bit. Another problem that we found was that try as you may, you’re not going to be able to save every village. It’s virtually impossible. You’ll find yourself ignoring those hard to reach areas to set yourself up in a better situation for the next area. I realize that’s gonna pull you out of the theme a bit but it’s about the only thing you can do if you want to win the game. There does seem to be a bit of scaling difficulties as well. 3 players is easier to play than 2 and 5 is easier than 4. The reason is that with 2 and 3 players you only have 1 Akatsuki card come out while 4 and 5 players get 2 cards. 3 players can fairly easily take down 1 card while 4 players will find it rather tough to get rid of 2. Overall it’s depends on how many players you plan on playing with. As I said a minute ago, repetition seems to be pretty high here too. The game is simply about moving here and there and then rolling some dice to defeat a token or Akatsuki member. You’ll do this over and over and over again. Overall, the game isn’t bad especially if you know what you’re getting into ahead of time. As a fan of the show, I don’t mind it and actually think it’s kind of fun. Fans of the show should enjoy this one especially as thematically it’s pretty spot on. If you’re not a fan, you most likely won’t enjoy this one. For this reason I’ll recommend it for Naruto fans or players that don’t mind a lot of randomness and repetition. Other players may want to give it a play before choosing this one. Naruto Shippuden: The Board Game is a cooperative game set in the anime world of Naruto Shippuden the TV show. The game doesn’t take an extremely long time to play. Most game sessions last around an hour. The theme of the game is pretty much spot on with the show. Fans of the show will love this about the game. The artwork and components are really great. I especially like that each hero’s deck has a unique design on the back of the cards. I also really like the miniatures. The sculpts are quite nice. The game is fun, especially for fans of the show. There are some problems with the game as the scaling is kind of odd and there’s a good bit of randomness and repetition throughout the game. As long as you know what you’re getting into ahead of time, it’s not a really big deal. A few house rules make the game a bit better, otherwise the game tends to falter just a bit. If you don’t mind randomness and repetition, then the game won’t bother you too much. If you’re a big fan of the TV show, you’ll most likely enjoy the game. As a fan myself, I’m ok with it. It can be difficult and you will not be able to save every village, yet you don’t find that there tends to be the old alpha gamer syndrome that is present in many co-op games today. Overall I recommend this one for fans of the show. Other players might want to try it out first. For me, I like it. I just hope that there’s an expansion in the near future with a few rules changes to polish the game up just a bit. This entry was posted in Reviews and tagged badoux, board, board games, card, card games, cyril, Cyril Marchiol, games, japanime, japanime games, marchiol, naruto, naruto shippuden, nicolas, Nicolas Badoux, shippuden. Bookmark the permalink.